The Langhe lie in the southern part of Piedmont, close to the Maritime Alps and Ligurian Apennines. A great amphitheatre of hills, they are crossed by the irregular course of the River Tanaro, creating a clear geological division between two separate areas. To the right of the river are the Langa, the older of the two areas, and to its left the Roero. Rising up on the horizon to the south and west are the mountains that protect these hills from the Mediterranean climate. On the right bank of the Tanaro stands the Barbaresco wine growing area, south-east of the town of Alba. 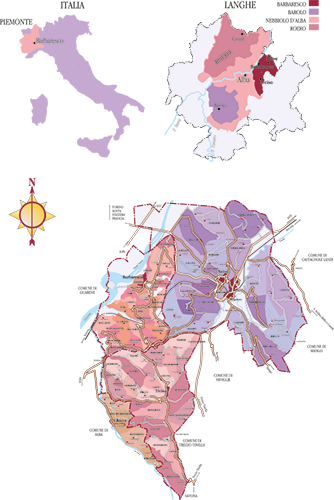 A small area, it takes in just three villages (Barbaresco, Neive and Treiso), plus San Rocco Seno d’Elvio, an outlying district of Alba. Seen from above, it resembles the head of a horse, or – better still – a cluster of Nebbiolo grapes with its wing. The hills are the area’s common denominator; long and steep, divided by deep, medium-wide valleys. The northerly-facing slopes are often interrupted by perpendicular ravines, the most spectacular of which in all the Langa, named the Seven Brothers, is to be found in the southern part of the commune of Treiso. The elevation is ideal for the growing of grapes: between 150 and 450 metres above sea level, with most of the range between 250 and 400 metres being used for Nebbiolo. 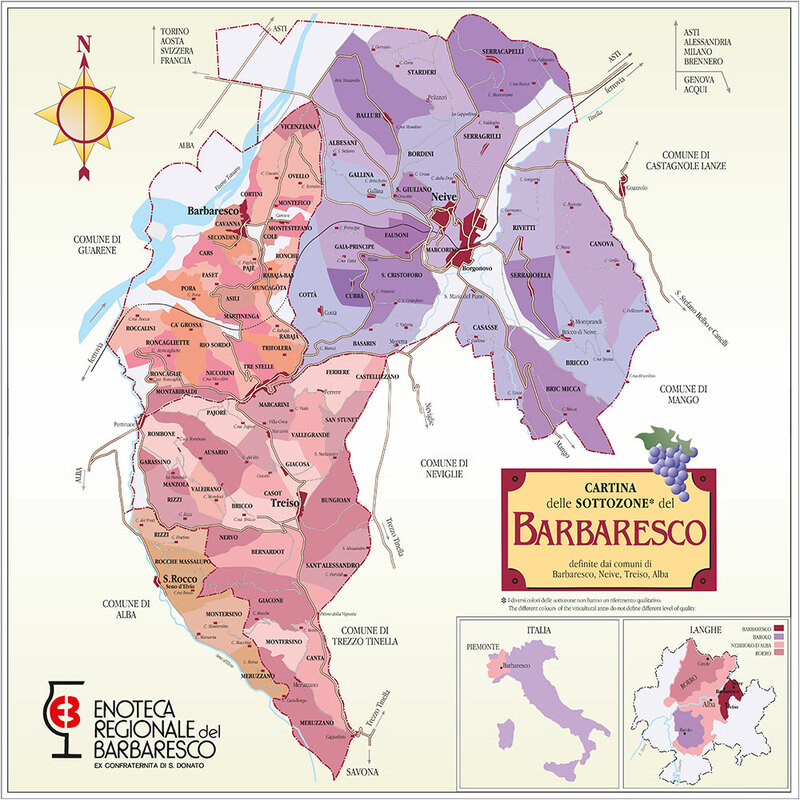 In geological terms, the Barbaresco wine growing area belongs to the Miocene Epoch of the Tertiary Period (between 23 and 5.3 million years ago). In the area taking in a large part of Treiso, S. Rocco Seno d’Elvio, and Neive to the south of the village itself, the soil is composed of so-called Lequio Formations (Tortonian-Serravallian), characterized by solid grey marls alternating with layers of sand. This less compact soil produces elegant, refined wines which are generally less well-structured. The area that includes Barbaresco, the part of Neive bordering on Barbaresco and the north-east of Treiso is formed of the bluish limestone marls of Sant’Agata Fossils (Tortonian). Here the soils are more compact, and produce well-structured, complex wines which withstand the test of time. The soil in the Barbaresco area is rich in macroelements (N, P, K) and also has a good supply of microelements (B, Fe, Mg, Zn, and Mn). It is sub-alkaline, with a pH of between 7.8 and 8. The climate is continental, as it is in the rest of the Langa and Roero. There is an average of 800-900 millimetres of rainfall a year, mainly concentrated during autumn, summer and spring. And there is relatively little wind: at the most, a faint breeze bringing relief in summer, protecting the vines from the heat. A distinguishing feature is the frequent fog that rolls into the westernmost part of the area where the influence of the River Tanaro is at its strongest.